In July 2015, an inmate was murdered inside the Bexar County Jail. Original reports were published to conceal the homicide and cause of death. Bexar County Sheriff Susan Pamerleau stated that his death was not the result of any actions by jail staff or other inmates. A year after the murder Bexar County District Attorney Nico LaHood states that he knows nothing about the case while he calls citizens inquiring about the death “ troublemakers” and other names . 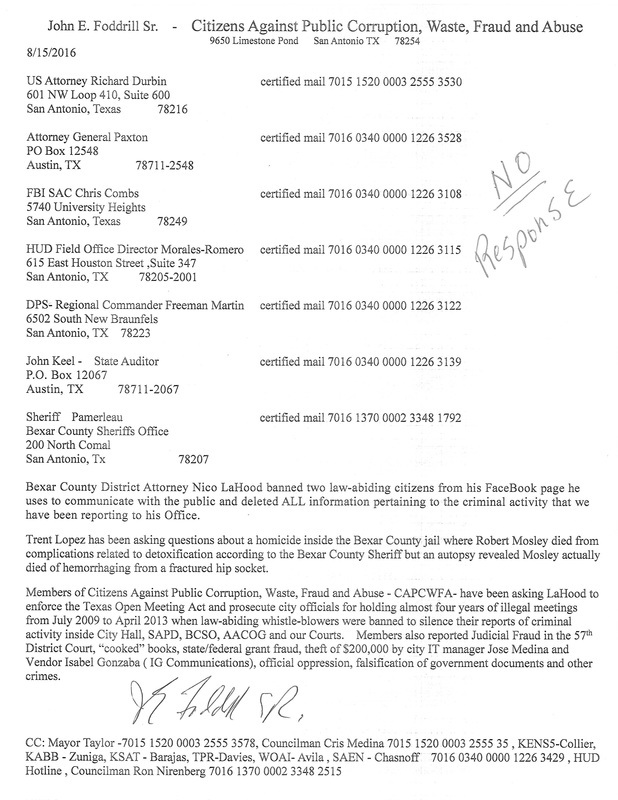 LaHood lies when he states that he will ask for an update and will reply to requests for information. 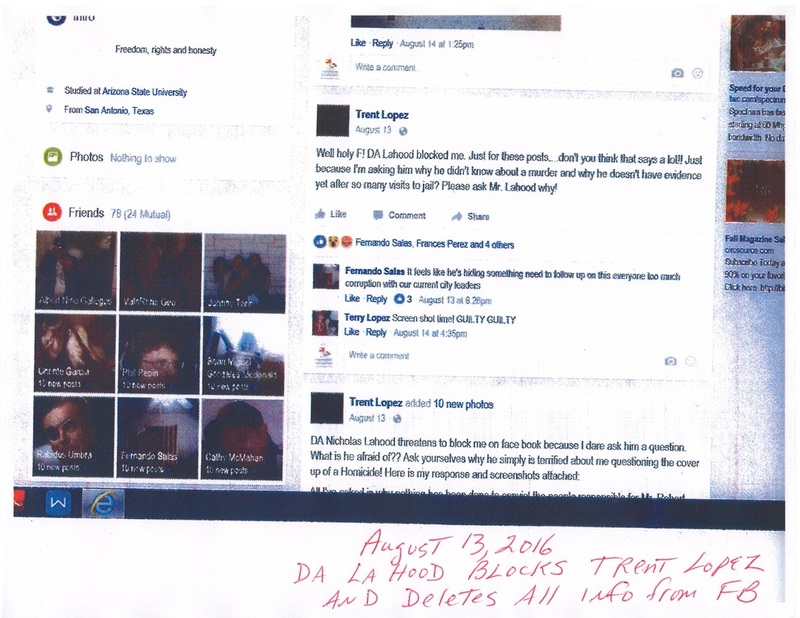 LaHood refuses to post information concerning the homicide , erases information posted by citizens and then bans taxpayers from his social media site he uses to communicate with citizens to halt the flow of questions and information. On Monday, July 27, 2015 the SA Express News published this short article. “ An inmate at the Bexar County Adult Detention Center died Sunday afternoon at an area hospital. Robert Mosley, 54, died at Metropolitan Methodist Hospital from complications related to detoxification, a preliminary investigation indicates. 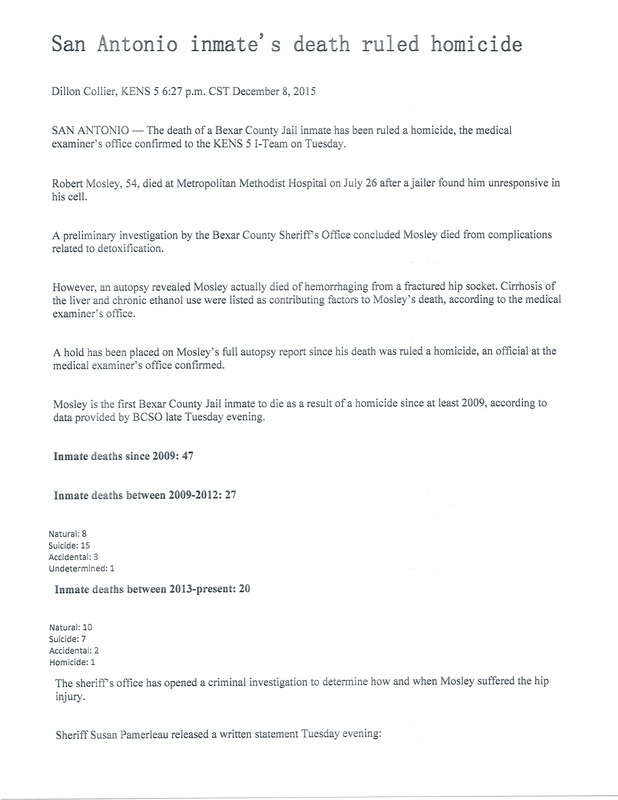 An autopsy will determine the exact cause of death, according to a Bexar County Sheriff’s Office news release. Bexar County Sheriff Pamerleau and her staff would have us believe that Robert was arrested for DUI and died four days later due to complications of his drinking. Robert was drunk, was arrested and died from complications of detoxification. Case closed…Happens all the time. On December 8, 2015 KENS 5 published this follow-up. SAN ANTONIO — The death of a Bexar County Jail inmate has been ruled a homicide, the medical examiner’s office confirmed to the KENS 5 I-Team on Tuesday…. 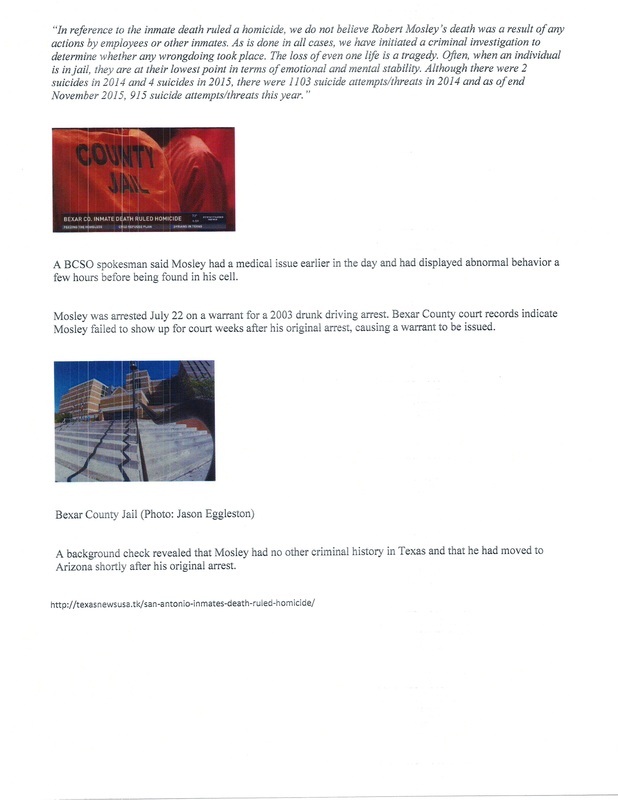 A preliminary investigation by the Bexar County Sheriff’s Office concluded Mosley died from complications related to detoxification. However, an autopsy revealed Mosley actually died of hemorrhaging from a fractured hip socket. The SA Express News published a statement by Robert’s family when they provided some important background information. 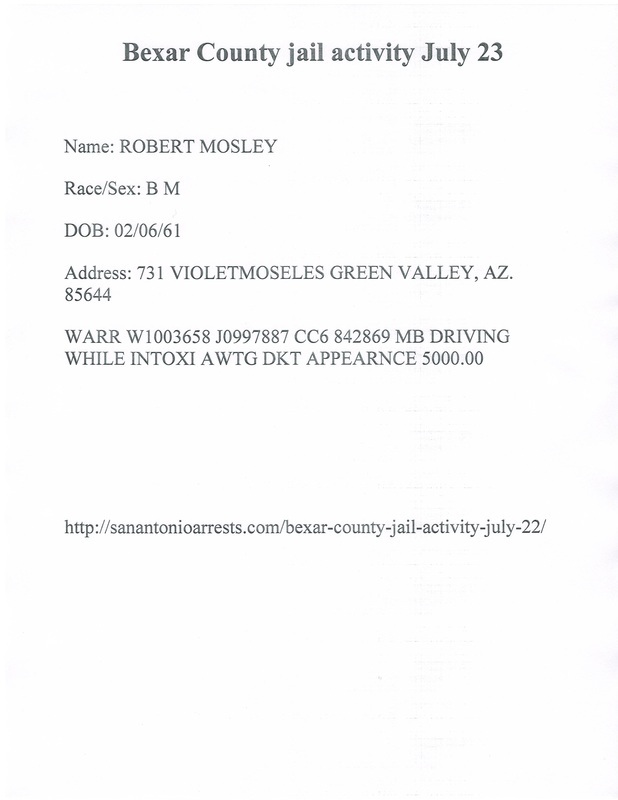 “ Mosley’s sister Kathy Selby said he was visiting from Arizona in 2003 when he was arrested and charged with DUI, noting his brother bailed him out the following day. Selby added that he returned to San Antonio voluntarily in July when officials began reaching out to him to pay the bail bond or come to court. Four months after Robert died an autopsy and background information shows that he died of hemorrhaging from a fractured hip socket and not from detoxification. We learn that the DUI charge was from 2003….thirteen years earlier. We learn that when Robert returned from Arizona he voluntarily tried to follow the law and turned himself in to address the outstanding warrant. We learn that four days later Robert died after his hip was fractured somewhere inside the jail facility and was hemorrhaging. 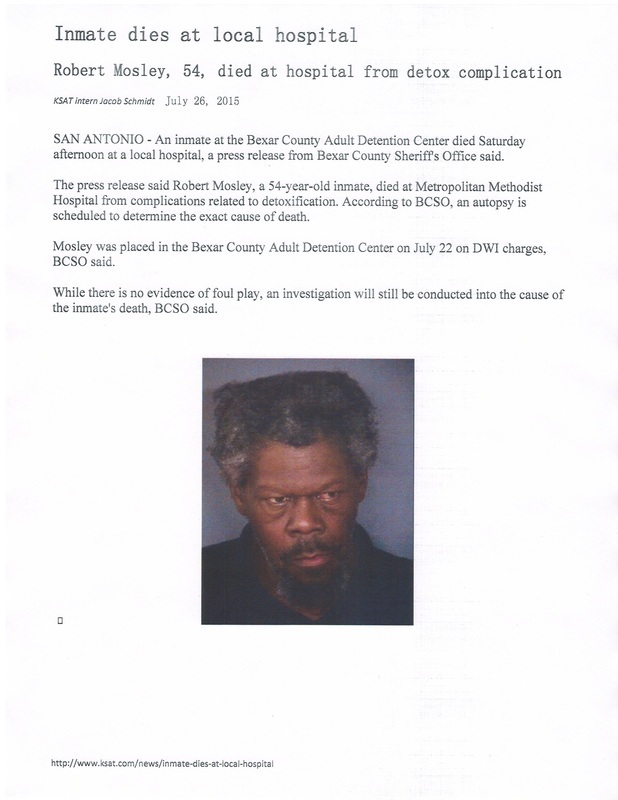 The media published a statement by Bexar County Sheriff Susan Pamerleau on December 8, 2015 where she stated: “In reference to the inmate death ruled a homicide, we do not believe Robert Mosley’s death was a result of any actions by employees or other inmates. The FBI, the DOJ, the DPS, Attorney General Paxton and others ignore certified mail and play along with the cover-up.